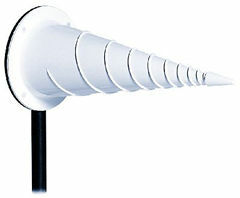 3102 Conical Log Spiral Antenna. Outside windings improve heat dissipation. This cone is attached to a delrin rod equipped with an aluminum base. The antenna mount base accepts standard 1/4 in x 20 threads from a tripod. Once used exclusively for MIL-STD and SAE testing, conical log spiral antennas are effective for other types of measurements too. For example they can be used for close-in "quick-looks" to find the spectral characteristics of RF emissions. For immunity testing, conical log spirals generate reasonable field strengths with modest power input. By placing conical log spiral antennas in a vertical position with respect to the ground plane, they can also be used as omni-directional, horizontally polarized antennas for electromagnetic site surveys. Individually Calibrated at 1 m per SAE ARP 958 Actual antenna factors and a signed Certificate of Calibration Conformance provided. ETS-Lindgren Tripod. Several nonmetallic, non-reflective tripods for use at EMC test sites. Right-hand circular polarization. This option reverses the antenna windings for right-hand polarization.